Athletes will choose one movement to do for 3:00, then another to do for 2:00, and the final for 1:00. * Partner 1 does 20 reps of each (Partner 2 will be spotting/resting). Then Partner 2 will do 20 reps of each (Partner 1 will be spotting/resting). Partner 1 will then go to 18, Etc. *If done without a Partner then work to rest is 1:1. Muscle ups and Peg board play! Begin the rope climbs seated on the floor. 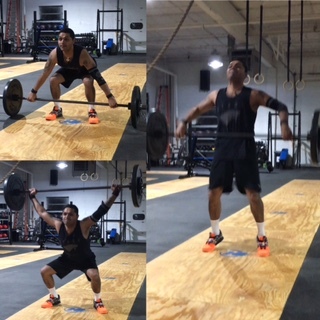 Prab Singh is February’s Hyper CrossFIT’s Athlete of the Month. Learn more about Prab, the New York native, quick on his feet boxin’, Budget Management Leader and the Hyper CrossFIT athlete we are very proud of. How did you learn about CrossFit and how did you end up in our awesome Box? I moved here in June 2015 and was looking for a place to get back in shape. I just so happened to come across our Box and decided to try it out. I’ve worked out on my own in a traditional Gym, but never really stayed consistent. So, I figured maybe a group/community type place might work for me. I took the Elements course and never looked back. What do you like most about being a FIT member (Hyper CrossFit Athlete)? The community. The people are awesome. I’ve made some pretty cool friends at this place. The coaches are friendly and keep you moving. What are you still working on to achieve? I’m still trying to do a muscle up. My ultimate goal would be to do a strict muscle up, but that’s long term. Tell us one random fact about yourself that has nothing to do with CrossFit. I like boxing. I never actually watched boxing, but I love to train. I’ve wanted to compete for a while now, but I still need some coaching. What is your favorite WOD or benchmark? I don’t have one. WODs are all different, I like and hate them equally. What advice would you offer to someone interested, but intimidated to try CrossFit? Just try it! You never know unless you try, but you have to be consistent. Rome wasn’t built in a day and you’re not going to become a bodybuilder by doing it once or twice. Consistency is the key to success in fitness.